It is every travel lover dream to visit popular hill stations like Coorg and Ooty and a historical, culturally rich city like Mysore. Mysore with its rich historical background, Coorg and Ooty with their unparalleled scenic beauty present a perfect holiday choice which combines best of both the worlds. Hence, we at Holidays DNA have brought special tour packages which combine the experience of all the three places in one single tour. Our Mysore Coorg Ooty Tour packages present travelers with the choices of exploring all these destinations in way which suits them. Whether you are looking for a tour package from Mysore to Ooty and Coorg or a tour package of Mysore, Ooty and Coorg from major cities like Bangalore, Hyderabad, Chennai, Pune, Mumbai, etc; you will get wide array of suitable choices at www.mysoretourism.travel, a Holidays DNA portal. Our travel experts carefully design Mysore Coorg Ooty Tour package for every kind of holiday varying from budget to luxury and honeymoon to family trip and group tours. All the three destinations boasts of an amazing range of sightseeing places and activities. below are some of places that you can explore while on a Mysore Coorg and Ooty tour. A historical city, Mysore presents its visitors not with museums and palaces but a wide array of sightseeing choices and extensive range of activities. From lakes to hills to palaces and gardens, the city of Mysore offers a perfect holiday break to everyone. Mysore Palace- Also called Mysore maharaja Palace and Amba Vilas Palace, Mysore Palace is one of the most biggest palaces of India, that still captivate everyone with its unwavering architectural beauty. It was first built in 1912, and later its wooden structure was rebuilt into the current building. Chamundi Hills and Chamundeshwari temple- Dedicated it Goddess Chamundi, who is the deity of Mysore Royal Family, Chamundeshwari temple is located on top of Chamundi hills. Along with religious significance, these hills attract tourists with their scenic beauty as well. Mysore Zoo-One of the oldest zoos in the India, Mysore Zoo is blessed with rich flora and fauna. It has various rare species of animals which have brought from around the world. Its avian fauna is especially known as many endangered birds have been kept in its natural environment for breeding and sustaining. 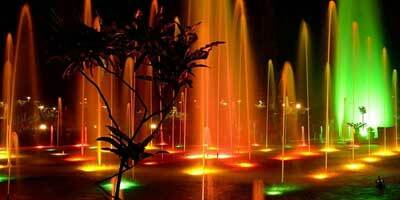 Brindavan Gardens- Known to be one of the best terrace gardens in the world, Brindavan Gardens captivates everyone with its spectacular landscapes, varied kinds of flowering plants, park and illuminated fountains in evening. Boating here is also very popular among visitors. Buddhist Golden Temple, Bylakuppe- Bylakuppe, which is a Tibetan settlement, offers calm and serene environment for visitors to experience peace amid aura of spirituality. Only 90 km away from Mysore, this place presents a different world altogether. Buddhist Golden Temple or the Namdroling Monastery is one of the popular religious shrines. Dubare Elephant Camp– Dubare Elephant camp is one of the most important parts of Coorg tour. It is located on the banks of Cauvery River where elephants are trained for Dasara Festival. Here visitors are allowed to have a close interaction with elephants; they can bathe, feed as well as take ride on the elephants in the jungle. Talakaveri /Talacauvery– Another place to see in Coorg is Talakaveri. It is located in the Brahmagiri hills. Although it holds high religious significance, it is not only visited by devotees but also by nature enthusiasts. Scenic beauty here is worth capturing. Raja’s Seat- It is the place where Kings used to sit and enjoy the startling beauty of nature. It is now a popular view point where tourists can sit and bask in the calmness and serenity of the soundings. Sunset and sunrise view is breathtaking. Abbey Falls- One of the most beautiful waterfalls in South India, Abbey falls are situated about 19 km from Madikeri. Tourists can have an adventurous trekking experience here. The scenic beauty of this place mesmerizes everyone. Madikeri Fort- Presenting a peek into the history of Coorg, Madikeri fort still stands majestically. Although it was built in 17th century, this fort has seen many renovations and changes by various kings including King Linga Rajendra Wodeyar II and even Tipu Sultan. One of the most popular hill stations in the country, Ooty allures every tourist with its incomparable beauty. Ooty has captivated even kings with its refreshing beauty; as it used to be summer capital of madras Presidency. Later Ooty became a holiday retreat for British. This hill station boasts of a wide array of sightseeing choices. Doddabetta- It is highest peak in the Nilgiris. Reaching the top of Dodabetta makes for a good trekking experience. The view of the hill station from top is awe-inspiring. If you want to have a better view of the surrounding area, you can watch from the telescope house which is located on the hill. Avalanche Lake- It is undeniably one of the most beautiful lakes of Ooty. Avalanche Lake is situated 28 km from Ooty. There is facility of fishing and even camping here at the lake. Botanical gardens- Built in 1848, botanical gardens are located at the foothills of Doddabetta Peak. Maintained by the Tamil Nadu horticultural society, these beautifully laid out gardens have a wide array of plants which have been planted over an area of 22 hectares. Ooty Lake- Ooty Lake is a manmade lake, which was built in 1824 during the colonial times. It is spread over 65 acres of area. Tourists visit this lake for spending a few moment of relaxation amid its natural beauty. Boating at this lake is also very popular. Ooty Mountain Railway- Declared as a UNESCO world heritage site, Ooty Mountain railway was built in 1908. It is a must visit when on a tour to Ooty.